Southerly swell… we had hoped to prove the forecast wrong, but upon arrival at the car park at Gordon’s Bay we knew that this had been mere hope. The waves came in strongly from the south, splashing several meters high in the air when braking onto the rocks. Clearly an effect of the last few windy days. We decided to jump in the Clovelly pool on the other side of the car park. The opening to the ocean is facing SE, but the separating wall was reaching almost the surface at low tide and broke the waves down considerably. It still looked more like surfing conditions than being suited for diving, but we were keen and decided to jump in. The entry from the stairs was a bit tricky due to the waves and the low tide. I hope the wind is going to cease soon, apart from that the diving conditions would be quite good. This dive was my first dive around the eastern suburbs, and what I saw will make me want to come back on a nicer day! 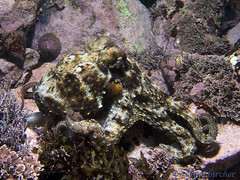 This entry was posted on June 25, 2008 at 5:10 pm and is filed under Divelog, Diving in Sydney, Underwater Photography. You can follow any responses to this entry through the RSS 2.0 feed. You can leave a response, or trackback from your own site.